The average bank balance of most Filipinos is less than P5,000. The Bangko Sentral ng Pilipinas (BSP)'s latest report (2017) on the State of Financial Inclusion shows 62 percent of all deposit account holders in the country only keep P5,000 and below in their bank balances. 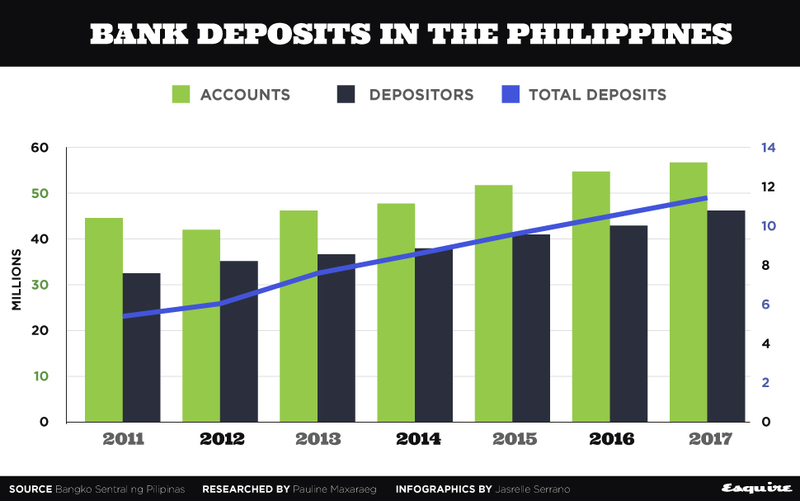 Though the number of deposit account holders in the Philippines increased by 6.8 percent in 2017 to 57.1 million from 53.5 million in 2016, a huge chunk of depositors only put small amounts of money in banks. The proportion of the number of deposit accounts corresponds to the deposit size. 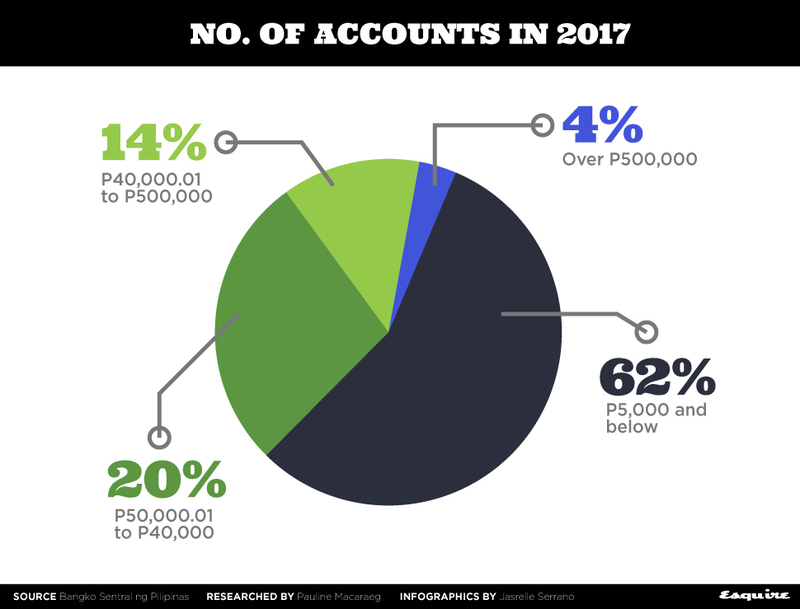 Those who keep P5,000 to P40,000 in their bank balances make up 20.4 percent of the total account holders population, making them the second biggest cluster. Following this are those who maintain P40,000 to P500,000 at 13.8 percent. 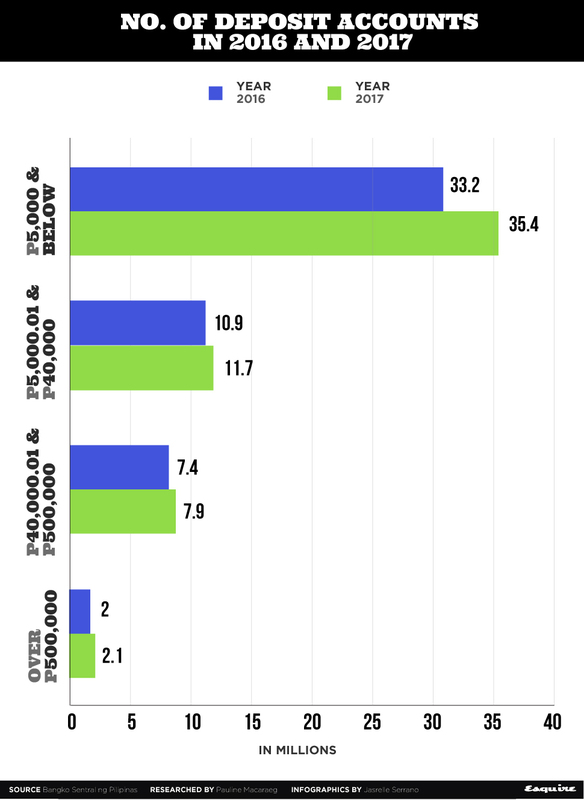 Those who have over P500,000 bank balances, meanwhile, only make up 3.7 percent. Still, the number of account holders increased across all deposit size groups, from 2016 to 2017. The biggest growth is attributed to the group with bank savings of P5,000 to P40,000 at 7.3 percent. The number of account holders, depositors, and total deposit amounts has grown throughout the years as well. It steadily increased since 2011, indicating the Filipinos' better attitude towards banking and aÂslightly more inclusive financial system in the country. Excluding the year 2012, when the number of accounts dipped to 3.9 percent from 2011, the total number of deposit account holders in the country has grown by millions each year. The number rose by 31 percent from 43.6 million to 57.1 million in just six years. The total number of depositors follows the same trend. It jumped by 44.3 percent from 31.4 million in 2011 to 45.3 million in 2017. As well, the total deposit amount grew to 11.7 trillion in 2017, more than double the 2011 amount of 5.4 trillion.